The picture above shows one of the specially off-pointed images of the Sun taken during the campaign to observe the comet, but notice, the image shows the Sun, no comet! So SWAP and PROBA2 performed beautifully, doing just what we asked of them, but the comet simply failed to materialize. As a result, instead of analyzing dramatic data on Friday morning, SWAP scientists were left to wonder why Comet ISON failed to make its long-anticipated appearance. There are several possibilities. As Comet ISON approached the Sun, there were several indications that its icy core had fractured or even completely disintegrated. In fact, the evidence was ambiguous, and even now, after the comet's passage, it remains unclear exactly what was left as the comet hurtled through the solar corona towards its close encounter with the Sun's scorching surface. If the comet did break up, it may have passed perihelion as a faint cloud of dust and debris, undetectable by SWAP or other EUV imagers tuned more for observing bright solar flares than ghostly clouds of comet dust. Perhaps the comet had completely evaporated by the time it reached SWAP's off-pointed field of view. What exactly happened is not a question the SWAP team can answer, but new data will hopefully emerge in the coming days as more and more ground- and space-based instruments are turned towards the comet's possible remants. One of the reasons so many solar scientists anticipated Comet ISON as much as they did was because of another sungrazing comet, Comet Lovejoy, that put on a good show in 2011. Although ISON was bigger than Lovejoy, its solar passage was somewhat more distant. Comet Lovejoy's perihelion distance was roughly 0.00555 AU (Astronomical Units), or roughly 0.5% of the distance from the center of the Sun to the Earth. ISON, meanwhile, had an estimated perihelion distance of 0.01244 AU, about 1% of the distance from Sun to Earth. While many astronomers said that that Lovejoy was therefore only about 2.5 times closer to the Sun than ISON, these distances are actually measured from the center of the Sun, not the surface of the sun. As a result, in practical terms, we can say Lovejoy passed within about 130,000 km of the Sun's blazing surface. That's barely a third of the distance from the Earth to the Moon, a hairsbreadth in astronomical terms. ISON, meanwhile, passed more than 1.2 million km from the Sun's surface. That's nearly nine times farther away and, since the Sun's irradiance falls as a factor of the distance squared, ISON experienced something like 1/80th the total solar heating that Lovejoy experienced. Furthermore, the region of the solar corona that ISON passed through is something on the order of 50 or 100 times less dense than the region of the solar corona that Lovejoy passed through. Perhaps the combination of substantially less heating — and therefore evaporation — and substantially less coronal density for ISON to interact with meant there was simply not enough material involved in the coronal interactions caused by ISON for SWAP to see. SWAP is tuned to see light generated by two particular ionization states of iron atoms (we refer to these as Fe IX and Fe X, pronounced "iron nine" and "iron ten") that occur when the iron atoms are heated to about 800,000 or 1 million degrees Kelvin. One plausible hypothesis for why Comet Lovejoy was so beautifully visible in EUV images from SWAP is that iron-containing dust evaporated from the comet's nucleus was quickly heated, though interactions with the surrounding solar magnetic field and coronal material, to very high temperatures and began to glow visibly for SWAP. Perhaps Comet Lovejoy had a more rocky, iron-bearing core that produced a lot of iron dust as it evaporated under the Sun's glare. This dust then became further broken down into individual ions that we could see with SWAP. There are good reasons to believe ISON was a unique comet, perhaps very different in origin and composition from Lovejoy and other similar sungrazers. If ISON was iron-poor, with a nucleus made largely of water ice instead of denser rock and dust, perhaps the material that evaporated during its close encounter with the Sun was simply not able to emit the kind of light we see with SWAP. 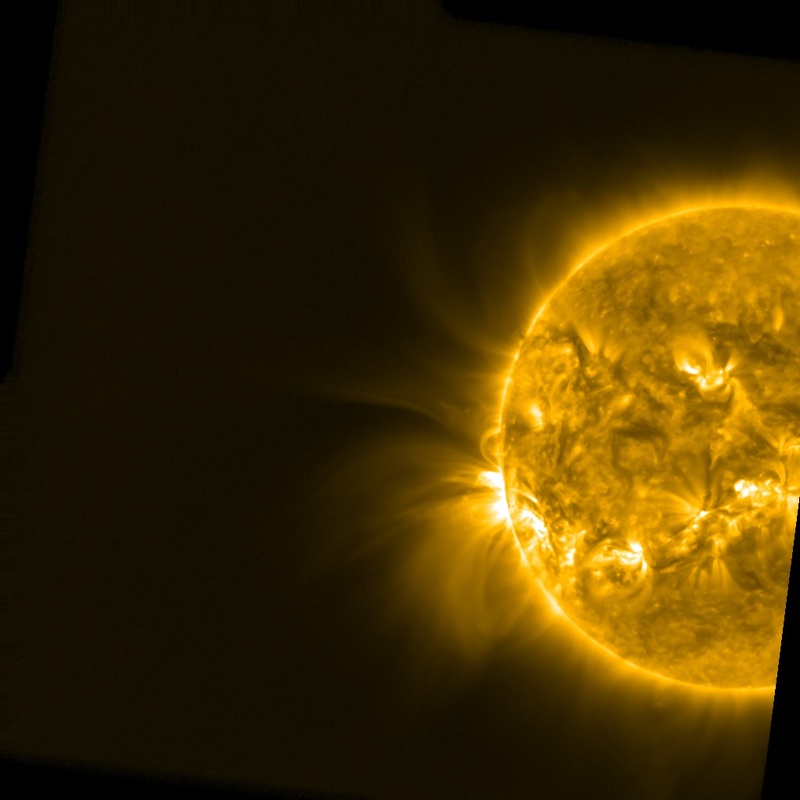 However, NASA scientists, working with data from the Atmospheric Imaging Assembly on SDO, have suggested that what we saw during Lovejoy's dramatic solar passage was actually emission from ionized oxygen atoms, which just happen to glow at about the same wavelength as the iron atoms we normally observe with SWAP. This oxygen would be produced by the breakdown of water molecules—carried on the comet in the form of ice—into hydrogen and oxygen atoms due to extreme heating close to the Sun. If this hypothesis is correct, the mystery is even deeper than we originally suspected, for surely ISON carried plenty of ice. 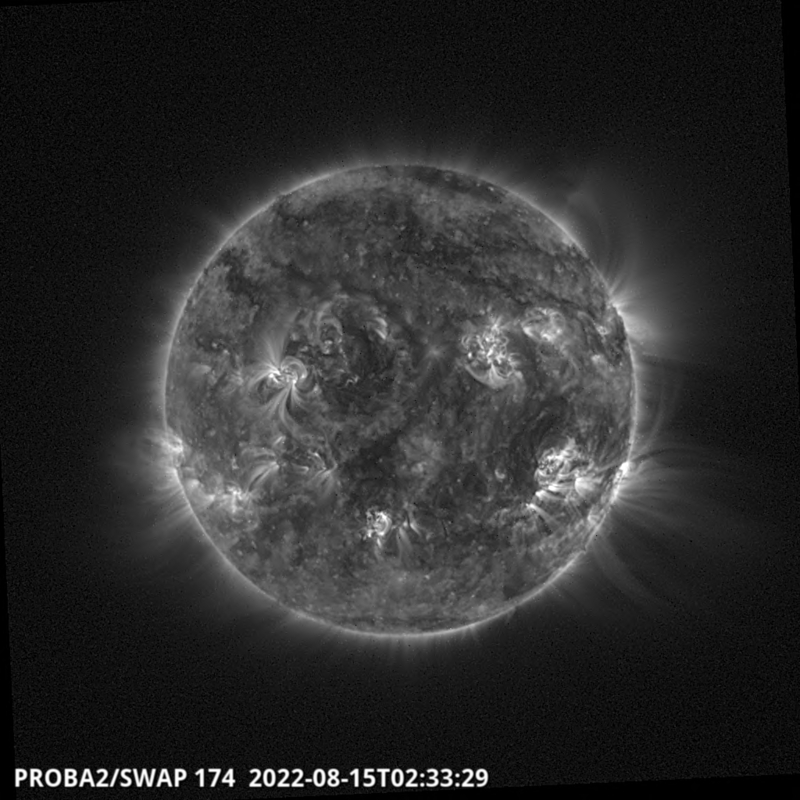 So why don't we see it with PROBA2 or with its larger cousin SDO? Could the oxygen hypothesis be wrong? Or could one of the other possible explanations above at work? One of the beautiful things about science is that even when you don't get the answers you expect, there's still plenty to learn. Comet ISON, even in absence, can help us test our understanding of comets and how they can interact with the Sun. In the days ahead, perhaps other instruments in the ISON observing campaign will offer reports and data that shed light on the comet's composition and the plausibility of all of these hypotheses. What else can we learn, then? Whatever the reason SWAP didn't see ISON, the campaign did provide us with some other unique data. 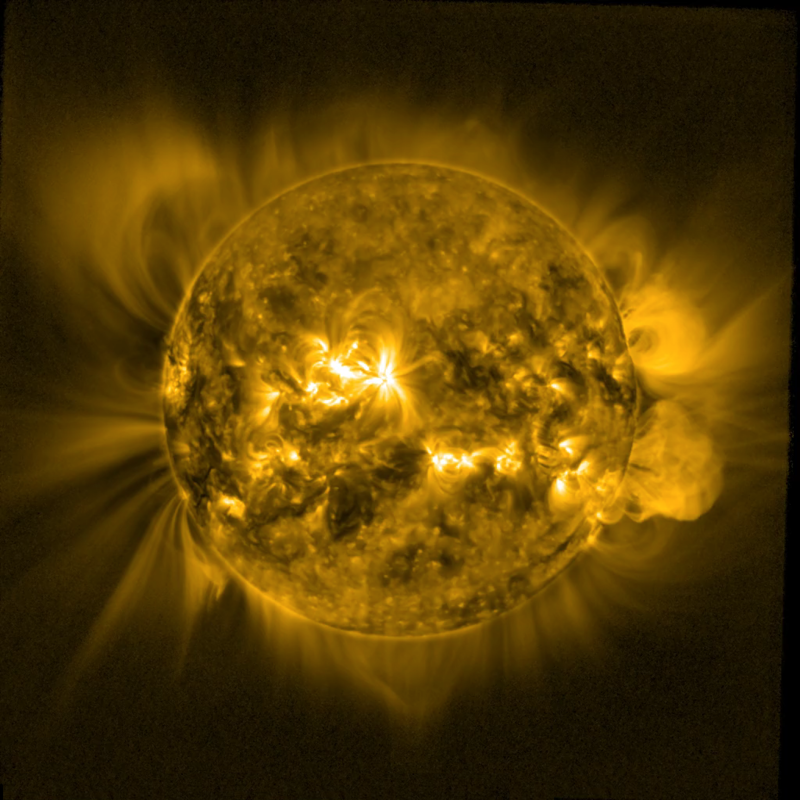 We rarely turn PROBA2 so far from the center of the Sun, and the images that resulted offer a unique look at the EUV corona in a region where it is relatively little-studied. 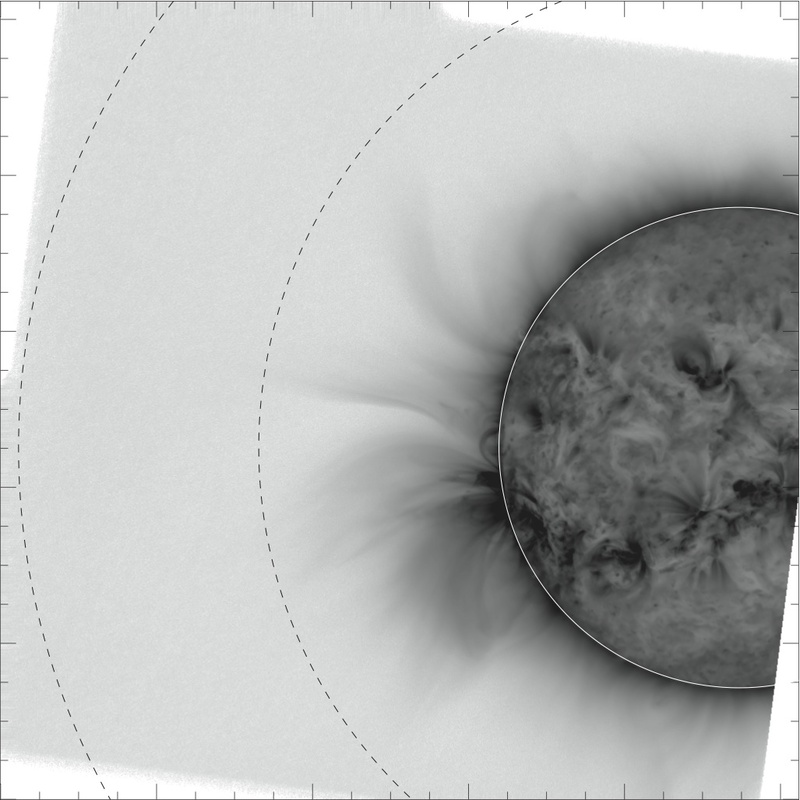 The image above shows an inverse color view of the solar corona (that is, black is bright and gray/white is dim) obtained during the ISON campaign. 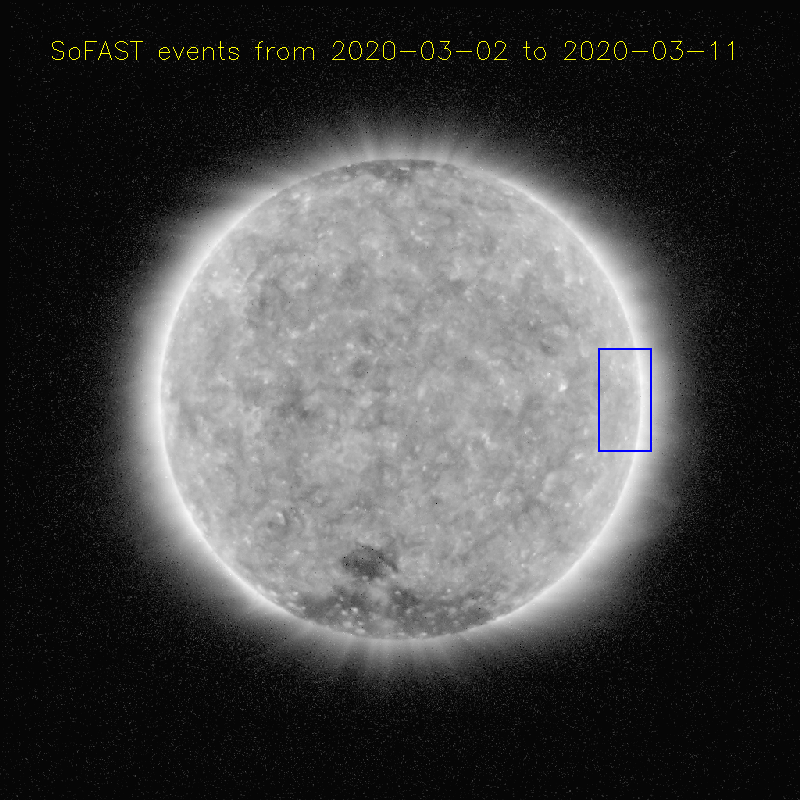 The white circle indicates the location of the solar limb, and the dashed lines are distances of one and two solar-radii above the limb. Studying what structures are visible and how far out we can see them provides us a wealth of useful information. Notice the bright extended structures visible near the center of the image. 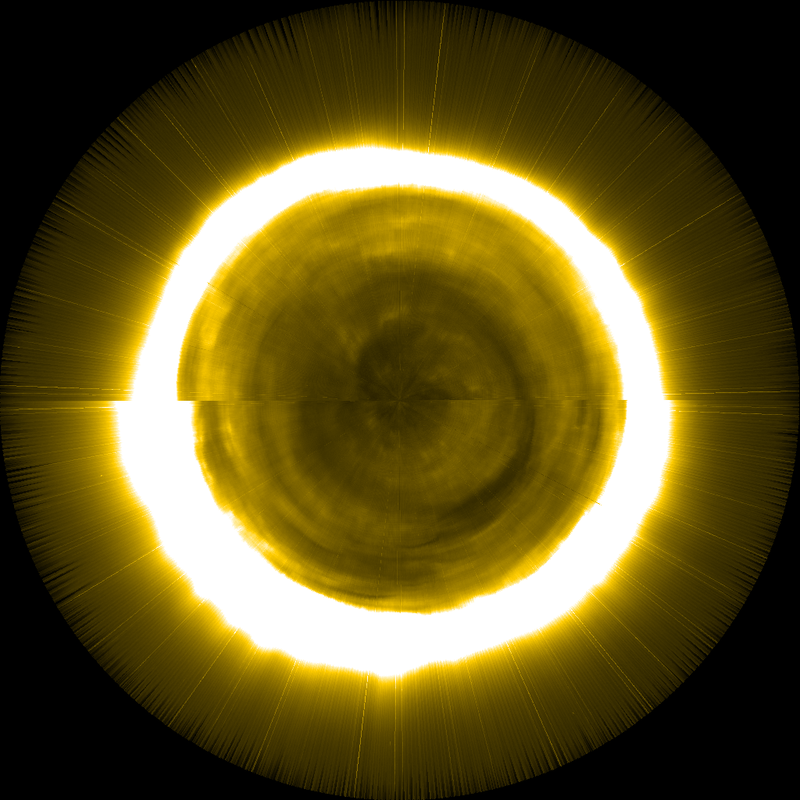 These stuctures are visible to heights of at least a full solar radius above the Sun's surface — perhaps farther — but quickly fade from view at large heights. The shape of these structures tells us much about the shape of the Sun's magnetic field in this region, and the brightness and rate at which the structure fades can tell us about the material in the corona itself. We learn about how the corona is heated, by what processes it becomes illuminated in the EUV, its composition, and the nature (temperature, composition, physical processes that are ongoing) of whatever stuff is present there. With the Sun at the center of the image, SWAP's already large field of view is still not large enough to show the full extent of coronal structures that reach large heights, so these special images can be nonetheless useful even in the absence of Comet ISON. The SWAP team will continue to analyze these images, search the faint background for any signs of the comet, and coordinate with other observation teams to see what else can be learned from the exercise. We will also file away what we think went right and wrong during this campaign to help our planning the next time we're visited by such an unusual traveler from the far-distant reaches of the solar system. For more about sungrazing comets, close encounters with the Sun, and what we can learn from them, check out this video from Science Magazine. Stay tuned to the PROBA2 website ad this story, which we will continue to update as more information about ISON becomes available. Media inquiries regarding PROBA2's Comet ISON campaign can be directed to PROBA2 PI Dan Seaton at dseaton@oma.be. A press release is available via this link.